Travelling with Sir Robert is more than just a special experience, it is an adventure of superlatives. Corsica is the island of beauty, `La Beaute`. The sun and the sea have loved each other so much that they created Corsica, says Antoine de Saint-Exupery. Corsica is the right place for those who want to combine an entertaining sailing trip with Corsican nature experiences. Those interested in history will also get their money’s worth and can breathe living history in Calvi. Arrival in Nice, embarkation in Villefranche-sur-Mer, the beautiful bay next to Nice; boarding and reception with sparkling wine takes place at 6 p.m., as well as presentation of the ship and sail introduction in the rigging. Sailing enthusiasts are always welcome to take an active part in setting sails or to enjoy being `sailed`. 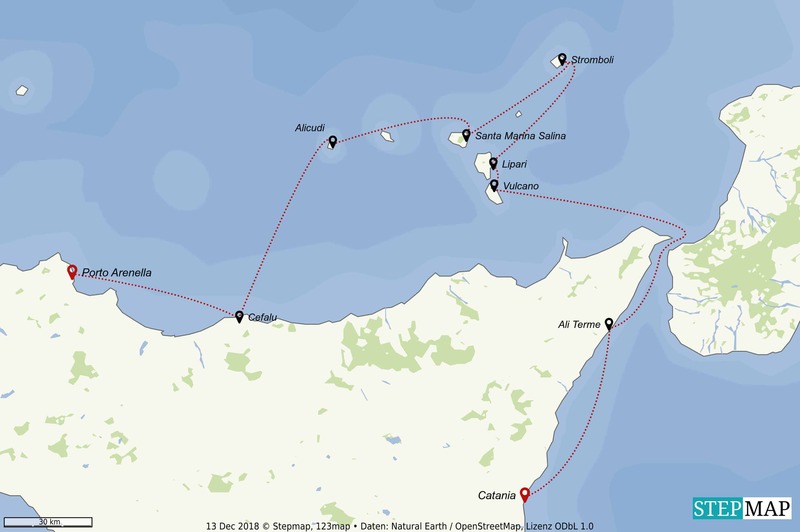 In the early morning we leave for Corsica and sail towards Cap Corse, the headland in the north. La Beaute’, the island of beauty with its diverse nature welcomes us for breakfast from its most beautiful side, the west coast. Impressive rocky landscapes, wide sandy beaches and dreamy little bays – we head for Calvi in the evening. With the citadel, the Genoese fortifications on the rocky spur and the hustle and bustle in the pretty alleys, it is a lively town that is very impressive. After breakfast we visit the impressive fortification of the citadel in Calvi and at noon we sail south to Galeria with the charming Fango Valley. It is worth a leisurely paddle round in the delta mouth of the Fango with water lilies and turtles. Afterwards we walk past the Genoese tower ruin to Galeria, the cosy seaside resort and enjoy a sundowner. Today we go to the famous nature reserve La Scandola, the mountainous peninsula in the Gulf of Porto. Since 1975 ospreys, peregrine falcons and silver gulls have been protected in the magnificent rocky landscape. In the evening we anchor at Girolata. The idyllic fishing village is only accessible from the seaside or on foot. Some houses, a small Genoese fortress, nice beach restaurants, and sometimes a cow on the beach create a magical atmosphere. 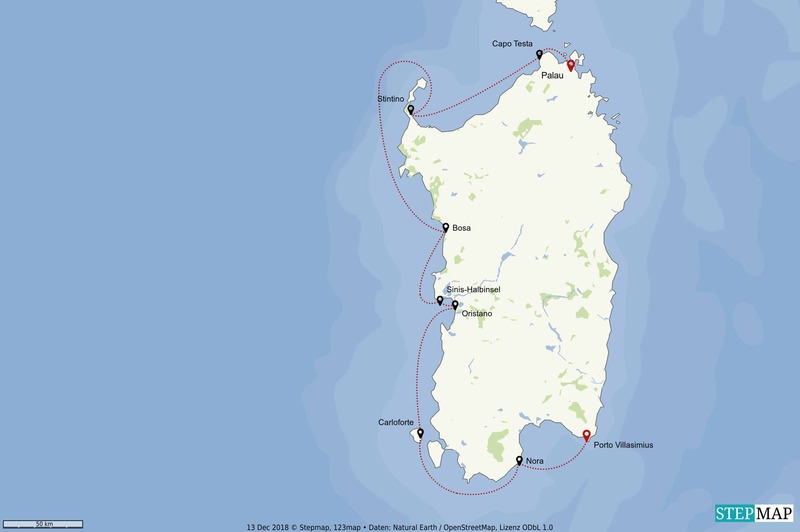 Today we sail through the Gulf of Porto to the southern end, to Capo Rosso, the huge rocky peninsula. The impressive 330 m high rock top of pink porphyry rock with the Genuese tower “Tower of Turghiu” is overwhelming. Osprey nests and bizarre grottos, into which we drive with the Dinghy, complete this natural spectacle. In the afternoon we sail to Cargese, where we anchor. Graciously situated on the rocky ledge above the sea, not only a Greek and Catholic church offers a tranquil ambience. A walk between the quiet place and the marina is worthwhile. 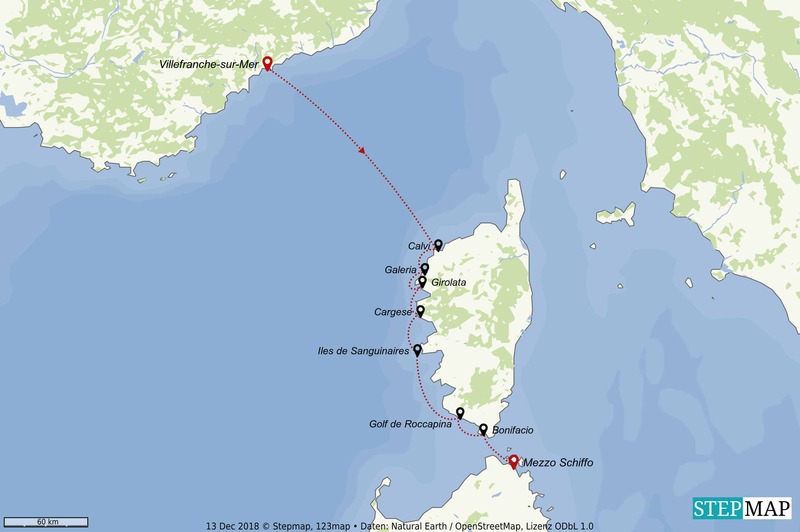 Today we sail under full sails through the Gulf of Sagone, the largest gulf of Corsica, to the smaller Gulf of Ajaccio and pursue our maritime activities before anchoring at the Iles de Sanguinaires. The island series offers crystal clear water, rocky coastline and invites you to take a stroll along the Grande Sanguinaire, from the lighthouse to the Genoa Tower. In the afternoon we go to the Golf de Valinco and at Porto Pollo we drop anchor and enjoy the wonderful mountain silhouettes at dinner. In the early morning we lift the anchors and lie hardly later before Propriano, in order to start from there a Corsican landscape bus tour into the mountains. First stop St.Lucie, where we visit an oil mill. Afterwards we go to Zoza, from there we make a small hike to the rock pools there. Finally we enjoy a stroll through the medieval Sartene – the original Corsican town. In the afternoon we sail into the Gulf of Roccapina, with one of the most beautiful beaches of Corsica, in front of an impressive rocky hilly landscape. The Golf de Roccapina with perhaps the most beautiful beach Plage Erbaju invites you to a short walk from the beach through the Macchia up to the impressive mountain ridge, Rocher du Lion (Rock of the Lion). The upper rock looks like a resting lion, very impressive. In the afternoon we continue south to Bonifacio. Built high on the narrow rugged limestone ledge, it is the most imposing urban complex on Corsica. The southernmost city of Corsica captivates by its unique location and is definitely worth seeing. We arrive in the afternoon to explore as much as possible of Bonifacio on foot. Just the walk from the lower town up the wide stairs is rewarded with a gigantic view of the steeply sloping chalk coast. The narrow alleys, narrow houses, countless bars and tiny restaurants entice you to stroll. We leave Bonifacio late in the morning, enter the ‘Strait of Bonifacio’ and anchor at the Lavezzi Islands: a must for beach lovers, snorkelers & divers. Thanks to the long time as a marine park, the water is crystal clear, wonderful for snorkeling. On the islands and while diving you can almost touch impressive groupers. The view of Corsica and Sardinia is unforgettable. In the afternoon it becomes Sardinian-Italian, we change the guest flag and anchor in Porto Liscia or Porto Pudu. On the last morning we enjoy beautiful water one more time, before we lift our anchor and anchor at noon at Palau, in the bay Mezzo Schiffo. Easy check-out is at 16:00 at the latest. This route is a non-binding suggestion, where we go, will be decided spontaneously on the spot and depends on wind and weather. Changes and errors reserved. We offer fantastic, exclusive one-way cruises along the entire Cote d´Azur from Nice to Marseille and vice versa. The Calanque, Esterel massif, islands, bays, cities – exclusive summer refuges in the most beautiful maritime places of the Cote d’Azur. Choose your date and explore and enjoy the French Riviera with us. Arrival in Marseille, embarkation at Vieux Port, the old port of Marseille. At 18:00 boarding with sparkling wine reception, welcoming, presentation of the ship and preview of the expected program, followed by an evening stroll in Marseille. The Calanques presents itself, with magnificent white limestone rocks of incredible beauty, steep rocks that rise like cathedrals directly above the Mediterranean Sea. We enjoy the fantastic rock bays, the clear water, whether snorkeling, swimming or diving or directly from the ship. We visit the small harbour town of Cassis, framed by France’s highest steep coast with 400 m height in the east and the fantastic rock bays in the west, it radiates the charm of an old fishing village. A cosy little harbour lies in front of a panorama of superlatives. Cassis is also famous for its beautiful diving areas, as the water in the Calanques is very clear. The Sentier du Petit Prince nature trail on the peninsula near Port-Miou is always open. It was created in memory of Antoine de Saint-Exupéry (it is thought that the writer and pilot was shot down on the open sea between Cassis and Marseille in 1944). The small town of Bandol lies in `our` heavenly corner of the Mediterranean Sea. Even some builders were not able to take away the soft charm of the grown unity of beach bays, harbour, pine groves and charming small villas in front of the curved line of the mountains in the background. The place is pretty and well-kept, the wide harbor promenade shows itself with palm trees, mimosa and eucalyptus. Bandol knows how to preserve his village folklore. The fact that Bandol lies in the wine country is not to be overlooked, everywhere at the roadside wine farmers offer tastings of their art. The streets are filled with endearing temptation, it is worth giving in to it. Perhaps we will continue along the coast to Sanary-sur-Mer, where colourful fishing boats and white yachts will show you maritime nostalgia. Sanary’s beautiful charm in pink and yellow is impressive, despite the holiday-friendly staging. In the background, the ridge of Gros Cerveau keeps cool mainland winds from the terraces at the harbor. Next to the harbour promenade there is a lighthouse and a market place, where after the closing of the fruit and vegetable stalls the players play boule under the plane trees. After 1933, literary figures such as Heinrich and Thomas Mann, Arnold Zweig, Franz Werfel, Lion Feuchtwanger and Ernst Toller met in the harbour cafés of Sanary. Some places of their meetings still exist today, e.g. the Café de la Marine. We sail on to Iles de Porquerolles – off the southern tip of southern France, as part of the Iles d’Hyèreres archipelago – with the neighbouring islands of Ile de Port-Cros and Ile du Levant. The ‘Pearl of Hyères’, at the same time the southernmost point of the Provence coast, lies on the same latitude as the Cap Corse peninsula on Corsica. The Ile de Porquerolles is 7 km long, 2.5 km wide , characterized by Mediterranean character and agricultural use. The vineyards in the center of the island produce excellent wines and the island’s National Mediterranean Botanical Conservatory has a great variety of fruit trees. Pine trees and eucalyptus characterize the excursions of -exclusively- cyclists and hikers. Well-marked paths of over 50 kilometers in length offer us active tourists a great variety of hiking possibilities to the next beach. But also the bicycle rental is uncomplicated and possible at short notice. The Plage de la Courtade or Plage d Árgent are a delight with their white sand, the blue shining waters of the Mediterranean Sea and the great view of the sea at the cliffs in the south of the island. Ile de Port-Cros is smaller, more rugged, even greener and offers Caribbean flair. The original ‘underwater nature trail’, where you can explore a great variety of biotopes with snorkel and glasses, is absolutely worthwhile. Further we sail into the bay Golfe of Saint -Tropez, 7 km long, at Sainte-Maxime just 4 km wide and a wonderful spot for bathing and sailing. Above the world famous Saint-Tropez of the upper ten thousand and would-be celebrities, one forgets all too easily the other, original St. Tropez that still exists. The picturesque old town with its fishing port, the high citadel with its unique view, picturesque alleys and streets, has an almost village-like charm. On the large Place Carnot, shaded by plane trees, a Provencal market continues to be held. We enjoy a Petit Dejeuner in the morning at the Place des Lices, sitting in the shade under trees, wonderful. By the way: Guy de Maupassant discovered Saint-Tropez when he drove along the Cote d’Azur with his sailing boat `Bel Ami` in 1887. Maybe we’ll make a detour to Port Grimaud. In the very interior of the bay of Saint-Tropez, there is the artificial lagoon city, a Venice in which there are no country roads but water canals. Port Grimaud, built in 1966, is still considered a prime example of environmentally friendly holiday tourism. From the outside like an ancient town, inside you will find all the modern facilities. One of the most beautiful areas at the whole Côte d’Azur are the approximately 30 kilometres to Cannes: the Massif de l’Estérel protrudes into the sea and rises in the inland to a height of several hundred metres. We sail along here, a very exclusive pleasure from the sea side with the red shining rocks (rochers rouges), the deep blue water and anchor at Cap Dramont off the tiny island Ile d´Or a with bizarre tower. Swimming, snorkelling and diving is next. Today we sail on to the Iles de Lerins, the picturesque little islands off the coast of Cannes. Ile Sainte -Marguerite guards the `secret of the man with the iron mask` with the Fort Royal and Ile Saint-Honorat is privately owned by the monastery of the same name. With a length of only 1.5 km and a width of 400 meres, it is a wonderful walk through pine trees, oaks and monastic wine-growing as well as a visit to the old castle `Mönchsburg` with a wide view of the coastal region. Another sailing trip in the afternoon takes us to Antibes, beautifully situated, with the largest marina in Europe, Port Vauban and a magnificent old town. The maze of streets with shops, cafes, restaurants and the stylishly roofed Marche Provencal in front of the old town hall from 1828 is worth a visit. It is also worth visiting the Picasso Museum and the Cathedral. Here we have dinner away from home and enjoy the ambience. Today it goes to Villefranche-sur-Mer, with one of the most beautiful bays in the world and only 5 km from Nice. The beautiful small town with colorful facades of the old town, with only 8,000 inhabitants, offers a privileged anchorage. The old town with its small alleys reminds of the fishing village that Villefranche once was and partly still is. Once again it is time for swimming and lunch. Check-out is no later than 4:00 p.m. By the way, Villefranche-sur-Mer is highly recommended for a stay in the country. Drink a café au lait on the sunny terraces, enjoy a bottle of rosé or a typical fish dish – that also is a treat to enjoy. The cruise from Nice to Marseilles takes place in relaxed reverse order, for the transfers from and to the airports we are also available with information. The scenic diversity of Sardinia is grandiose. Dream beaches, wild mountains, oak forests, macchia, lagoons, flamingos and eventful Sardinian history. Oristano, Bosa and the whole west is of a special charm. For the first time we offer a longer trip along Sardinia’s picture book coast – a real temptation for all Sardinia fans. Arrival in Sardinia, flight to Olbia, boarding is at 6.p.m. at Palau. That’s where we’re anchored. At the reception with sparkling wine, the guests are welcomed, the ship is introduced, a preview of the expected program is given and then dinner is served on the aft deck. Early in the morning we sail through the fascinating Maddalena archipelago. The archipelago consists of about 60 islands and islets. With beautiful bays, shimmering granite rocks and exposed only to sun, wind and waves, it is a true island paradise. The two largest islands Maddalena and Cabrera can also be visited. At the northernmost tip of Sardinia, Capo Testa, we anchor and perhaps visit the popular holiday resort of Santa Teresa di Gallura. Early in the morning we lift the anchor, leave the Strait of Bonifacio to starboard and sail through the Gulf of Asinara to the peninsula of Stintino, the northwest tip of Sardinia. Maybe we will make a detour to the popular holiday resort Stintino with its small harbor. Or we stay in front of the island Asinara and plan an excursion to the Isola Asinara, with donkey ride or bike. The island is now a national park and no longer a penal colony. After a beautiful sailing trip, Alghero can also be on the program. With the atmospheric, Spanish influenced old town it is one of the most beautiful cities of Sardinia. The historic city center is crowded on a small peninsula and offers a vibrant Italian way of life. The harbor and the old city walls give a glimpse of the Catalan Gothic style. Today it goes down the west coast to Bosa, bizarrely built on the banks of the river Temo and dominated by Castello Malaspina. Citrus fruits, olive trees and vines thrive in the area. Behind the picturesque scenery of the fishing boats, the cheerfully colored old town of Bosa shines. Their winding alleys invite you to discover. We take the time to roam through the small alleys and it is worth it. 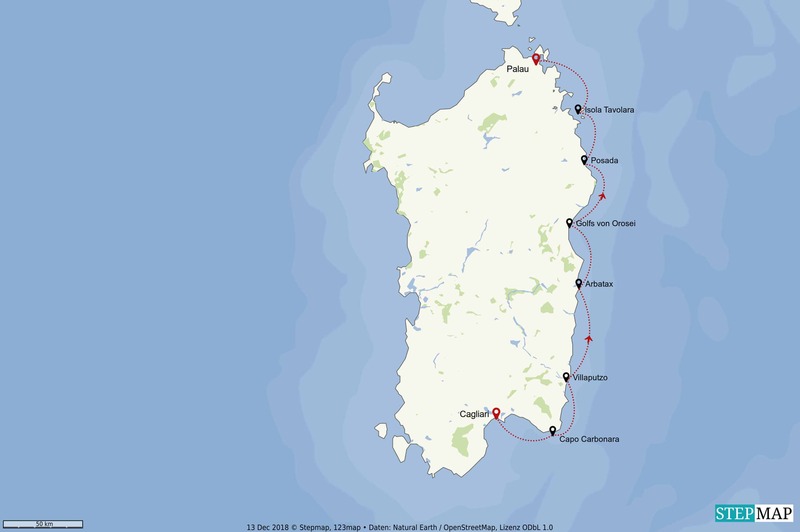 We continue sailing along the west coast to the Sinis Peninsula. The Sinis Peninsula with its impressive lagoons is protected, flamingos and terns can be seen next to around 150 bird species. A walk along the beach at the spacious Is-Arutas beach with the white-pink shimmering quartz grains is relaxing and massages your feet. Alternatively we visit the biggest lagoon Stagno di Cabras, where a wide reed belt surrounds the fish-rich area. This is where ‘bottarga’ is produced, the dried roe of the mullet (spaghetti bottarga – deliciously spicy, a genuine Sardinian national dish). Today, the program includes the Gulf of Oristano, a bay in the west of the island that extends deep into the mainland: two towers, Marceddì in the south and Torre Grande in the north, guard the bay and the surrounding area. Quiet flat landscapes with a variety of beaches, lakes, salt marshes and lagoons beckon. The beaches of Arborea are among the most beautiful in the Gulf: crystalline waters, white sand and lagoons, where rare birds nest and flamingos are common. At Torregrande beach, bars and stalls become a meeting place for concerts, parties and events in the evening. Maybe we’ll go there or enjoy our evening on board. The western part of Sardinia between Oristano and Bosa impresses with wide fertile plains and extinct volcanoes in the hinterland. We enjoy the protected lagoon landscape at the Gulf of Oristano and Sinis Peninsula. Precious wetlands, numerous bird species and long, golden sand beaches line the coast. This is the best place to enjoy fish and seafood. Maybe we will visit Oristano, stroll through the lively old town and visit the cathedral. Today the Costa Verde welcomes us from Marina di Arbus to Capo Pecora. It is bordered by miles of sandy beaches, with shifting dunes up to 60 meters high and is named after the green hinterland covered with juniper bushes and pine trees. This untouched natural oasis is grandiose – thanks to good protection regulations. Today we sail in the southwest of Sardinia to the largest islands of Sardinia and visit them: Isola Antioco and Isola San Pietro. The pretty capital of S.Pietro, Carloforte has a lot of Ligurian flair with its beautiful old town and the fortress Castello. In spring the famous Mattanza del Tonno, the traditional tuna fishery, takes place in Carlaforte. We are content with freshly caught tuna on the spot. In the very south the Costa del Sud fascinates with dreamy beaches, crystal clear, turquoise blue sea and Caribbean beauty. Thanks to strict building regulations the south coast is quite untouched. Maybe we’ll stay on the coast at Pula. A visit to the ancient town of Nora, with its well-preserved amphitheater is worthwhile – after all, the oldest seafaring town in Sardinia, 1000 BC. established by Phoenicians. Early in the morning, we sail through the Golf di Cagliari to the Marina Villasimius and enjoy the varied coastal landscape with wonderful bays. We end the last evening here lying at anchor or visit the village for an evening drink. In the morning we enjoy again the wonderful water, directly from the ship and a last tasty lunch, check out is in Porto Villasimius 4 p.m. This cruise schedule is not binding, but merely a suggestion, a suggestion that can be varied. All cruises are subject to wind & weather conditions, the ship’s command decides; subject to changes and errors. Sardinia, with an area of 24.000 square km larger than the state of Hesse, offers with its east coast emerald green sea, rugged mountains, long sandy beaches with shallow water, crystal clear, untouched nature reserves and beautiful towns. Sardinia is one of the most beautiful islands in the Mediterranean and we enjoy and discover the east coast in all its facets. Arrival in Sardinia, flight to Cagliari. Boarding is at 6:00 p.m. At the reception with sparkling wine, the guests are welcomed and the ship is introduced, a preview of the expected program is given and then dinner is served on the aft deck. The Gulf of Cagliari, also known as the Gulf of Angels according to legend, welcomes us with the promontory of Sant `Elia – a great backdrop. Maybe we’ll use half the day to see Cagliaria. Cagliaria is the capital of Sardinia. Its old town with the beautiful Basilica di Bonaria is situated on a hill and from the Bastione di Saint Remy you have a wonderful view of the sea. The surroundings of the city are also beautiful: miles of sandy beaches stretch east and west of Cagliari. The city has a large port with ferry connections to many Mediterranean destinations. Perhaps we will enjoy the day all maritime, with sailing, diving, bathing and relaxing on board. In the evening we anchor at Capo Carbonara, the narrow low peninsula in southeast Sardinia and see the small offshore islands Isola Serpentara and Isolei die Cavoli, the lighthouse island, in the evening light at dinner. The Sarrabus Gerrei area further above on the east coast attracts visitors with its fantastic coastlines and a granite massif. The coastline is characterized by fine sandy beaches, secluded bays, endless plains and enchanted mountain worlds. The port town of Villasimius is well known, as is the dreamlike Costa Rei with its string of beach pearls and the Muravera with its lonely, wide stripes of sand. Today we sail up the east coast and make a detour to Villaputzo. In the southeast of Sardinia, on the north bank of the Flumendosa, lies this picturesque coastal town, surrounded by Mediterranean maquis and jagged rocks. The seaside resort Villaputzus “Porto Corallo” on the Costa Rei is a real highlight for lovers of bathing and water sports fans. A longer sail lets us pass the beautiful coastal landscape and we enjoy the surroundings from on board. The harbour town of Arbatax and the tranquil town of Santa Maria Navarese invite you to stay at the marina and the famous red cliffs of Capo Bellavista near Arbatax can be admired from the sea side. Perhaps we will also make a coastal hike to the rock Pedra Longa directly at the sea, a beautiful path leads there from Santa Maria Navarrese. A beautiful sailing trip takes us up to the Golfo di Orosei, with dream-beaches, secluded bays and mysterious grottos. You can also dive and snorkel on the steep cliffs. The Gulf of Orosei, the approx. 30 km long inlet of the Sardinian east coast captivates by a gigantic limestone massif and the foothills of the Supramonte, whose up to 400 m high slopes drop vertically enormously to the sea. The gorges lead through karstified limestone and flow into sandy bays by the sea. Here are some of the most beautiful bathing-bays on the island, which can only be reached by water. Of course we visit the impressive stalactite cave Grotta di Ispinigoli, with the huge cave room over a steep staircase. In the middle there is a 39 m high stalagmite, which reaches from the floor to the ceiling, the so-called `Spina in Gola` (thorn in the throat). The largest stalactite in Europe. In return we treat ourselves to a guided tour with a local guide. Perhaps we will also visit Dorgali, a terraced village on the slopes of Supramonte. The village is a center of high-quality handicrafts, i.e. knotted carpets, ceramics, leather and crochet goods have a long tradition here. You will also find delicious red wines, cheese and the local olive oil to enjoy. We still enjoy to the full the picture-book landscape of the Gulf of Orosei and explore the rocky coast at Cala Gonone with numerous caves. We also visit the famous Grotta del Bue Marino – with our own dinghy. Cala di Luna, for example a wonderful white sandy beach bordered on both sides by rocky slopes. In the 70s hippies and freaks found this paradise and spent the summer and winter here. Meanwhile it is also a meeting place for freeclimbers. The coastal region above the Gulf of Orosei, `Baroni` to Olbia is scenically diverse. The long beaches of the dunes and the most beautiful cliffs of Sardinia are the best island areas. Posada, a striking spot with village and castle ruins in the national park of the same name, attracts us. The ascent is worthwhile, the place is charming and you feel like in the Middle Ages. At the piazza we enjoy the atmosphere and the wonderful view into the fruit and wine fields and hinterland mountain peaks up to the horizon. Maybe we also make a side trip to Santa Lucia, the snow-white sandy beach invites to walk along the beach. There we visit the small tranquil fishing port and the piazza with an original bar. At the pretty places St. Teodoro and Budoni we sail the coast up to the table island `Isola Tavolara`, almost 600 meters high, 4 km long and 1 km wide towers the huge limestone plateau in the Gulf of Olbia. In the west, a small headland runs flat into a sandy beach. A great place for snorkeling in crystal clear water or exploring the island on foot. Perhaps a relaxed dive on the southern cliffs is also tempting. A cosy fish restaurant, a family business with a nice beach bar, tempts you to have a cool drink. In the morning we sail along the famous Costa Smeralda as well as the famous bear cape Capo d´Orso to the Maddalena Archipelago, where we anchor in one of the countless bays. The Maddalena Archipelago with the main islands Caprera and La Maddalena has been a national park since 1997. The diving and snorkeling paradise in northeastern Sardinia, with its almost untouched underwater landscape, offers ideal conditions for an unimagined wealth of species in the Mediterranean. Maybe we’ll pay a visit to the charming town of La Maddalena. The charming Mediterranean small town with 12,000 inhabitants invites you to stroll. In the morning we sail to our beautiful anchorage near Palau, where we enjoy the wonderful water, directly from the ship and a last delicious lunch. Check-out is at 4:00 p.m. The Pitiusas, with Ibiza and Formentera as well as smaller islands around them, are a subgroup of the Balearic Islands. Due to the originally rich pine forest, the Greeks gave the name: the ‘pine rich’, today the Illes Pitiüses. Ibiza and Formentera are true beach paradises in the Mediterranean. Arrival in Ibiza and embarkation in the port of Ibiza city, or in the bay Cala Talamanca next to `Eivissa`. At the boarding at 6 p.m. with sparkling-wine reception, the guests are welcomed, the ship is presented, a preview of the expected program is given, followed by the first dinner on board and an evening stroll in the harbor. After the first extensive breakfast, the most important functions of the rigging are introduced, so that those interested in sailing can participate actively in sailing or enjoy being sailed. Since Ibiza & Formentera together are smaller than Menorca, we are very free and flexible in the trip design. Both islands offer a lot of charm and an incredible variety of nature, landscapes and beaches. We plan to sail around Ibiza & Formentera and thus today we sail south towards Formentera, a holiday island par excellence. Formentera is only 82 square kilometers large, flat, 10,000 people live there. The island is surrounded by beautiful beaches. At the small island S`Espalmador, 3 km long, 800 m wide, we lie at anchor and already enjoy here the wonderful sandy beaches, partly Caribbean, partly Atlantic feeling. Maybe we are on a bike tour, relaxing or longer, depending on our mood. In La Savina there are numerous bicycle rental companies, it is also worthwhile to stay there. We cycle to the south side, to Platja Migjorn, with 7 km one of the longest and most beautiful beaches. Swimming in the turquoise, clean water, the long and fine sandy beach invites you to walk or we enjoy a cool drink in the small beach bar Kiosko 62 before we cycle back. 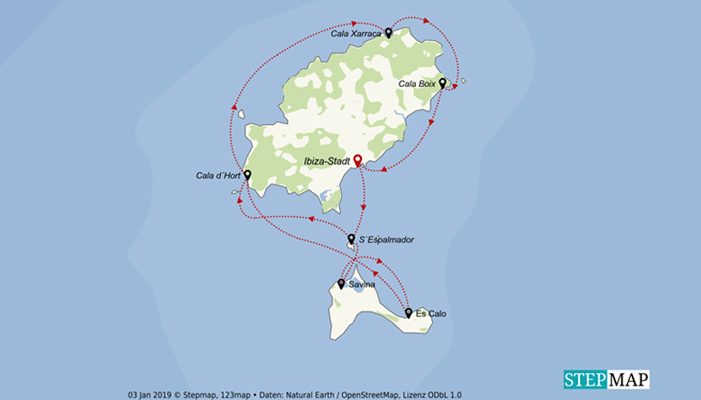 Today we make a nice sailing trip around the northern tip to Es Calo. The pretty village with its countless ‘ship garages’ still offers the flair of a fishing village and a relaxed ambience. 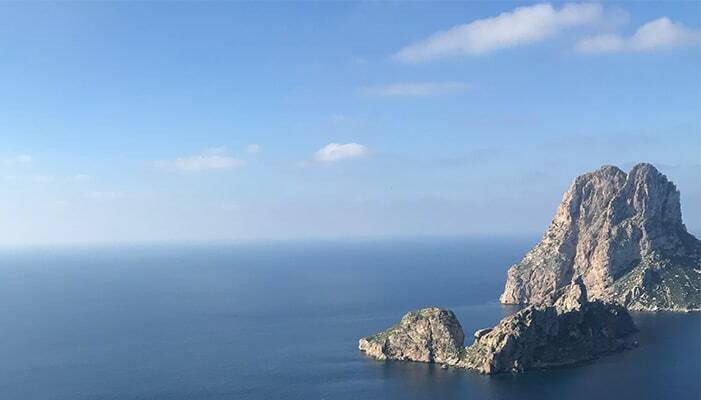 Now we are back in Ibiza on the west side and sail to the mysterious rock island Es Vedra, which rises 382 meters high like a volcano, uninhabited, mystical and next to it is the little sister island Es Vedranell, both dominate the southwest of Ibiza with their rocky peaks. We anchor in the Cala d´Hort, the charming bay with beautiful sandy beach, nice chiringuitos and fantastic views of the silhouettes of the islands. Maybe we will do a short hike through the Macchia to the Torre del Pirata. A narrow spiral staircase leads to the tower and you are rewarded with a spectacular view of the islands. The wide sea and to some extent the Spanish mainland can be seen from here. The predominantly rocky west coast with its fascinating panoramas offers a wonderful backdrop of almost untouched areas, fertile valleys with vines, olive trees, fig trees and perhaps it will tempt one or the other to spend some time in Ibiza. We sail up the north coast of Ibiza, past Sa Conillera, the nature reserve with countless bird species. In the north, the very rural region, there are some bays that are only accessible from the sea or on foot – just the right thing for us. Benirras or Cala Xarraca, wonderful bays, clear, clean sea water, – formerly hippe strongholds – and with a sundowner we end the day. At the northeast tip of Ibiza we continue sailing and anchor in the small Cala de Boix, a beautiful, quiet bay off the island of Tagomado – nature reserve and therefore suitable for bathing and snorkeling or simply for viewing and dreaming. Either we stay here or sail a bit further, past Santa Eularia, up to the narrow pebble bay Sol d én Serra with the very nicely situated Beach Club Amante. Perhaps Ibiza city ´Eivissa’ stands on the program, more than 2500 years old, one of the most beautiful cities at the Mediterranean Sea, multicolored, alive, cosmopolitan. Dalt Vila, the upper town is one of the oldest fortified towns in Europe, is a protected nature reserve and an absolute highlight. Within the monumental city wall there are impressive city palaces, steep stairways, narrow alleys, fine restaurants and here it is altogether much quieter than the lower town. Check out after breakfast and if you like, you can stay on the island for a stay in the country. The seven Lipari or Eolian Islands, a fascinating archipelago, are UNESCO World Natural Heritage sites, and rightly so! The volcanic phenomena of this charming archipelago are unique and each island has its own character. We offer the comfort of visiting every island and enjoying the magic of nature and genuine hospitality. The north coast of Sicily with mountains falling steeply into the sea, fertile lemon and orange groves, varied beaches belongs to the most beautiful areas of the island. Arrival in Palermo, boarding and sparkling wine reception will take place at 6 p.m. with presentation of the ship and preview of the expected program. Palermo, Sicily’s capital with 750,000 inhabitants, may or may not be loved, is in any case fascinating – and a chapter in it’s own right. We’ll be anchored nearby, west of Porto Arenella. Early in the morning we set sail and continue along the north coast to Cefalu, where we anchor. A visit to the pretty seaside resort of Cefalu is a highlight. There the houses from the Middle Ages reach directly to the beach. The picturesque old town with its sparkling, cobbled streets and narrow archways, romantic little baroque churches – everything has its own flair. A walk to the Normannendom or to the mighty Burgberg is also worthwhile. From Cefalu, we make a beautiful sailing trip up to the Aeolian Islands to Alcudi, a quiet outpost of the archipelago. On the small island lies the extinct volcano Timpone della Montagnola, it is up to 675 m high. About 100 people live here, transports are made by mule. There are beautiful dive sites and wonderful tranquillity. Our island hopping leads past Filicudi, the also small quiet neighboring island -10 sq m – and maybe with a stop we continue to Salina. Salina, the second largest island of the Isole Eolie o Lipari, is quite different: rich in water, green and fertile, with steep cliffs and two mountain peaks, Monte Porri with 860 m and Monte Fossa with 963 m, offering the highest elevation of the whole archipelago. The area, planted with macchia, chestnut, pine and holm oak forests, has been a nature reserve since 1981 and is ideal for beautiful hikes. Before Santa Marina Salina, the cultivated village with slightly romantic atmosphere, we stay overnight at anchor. With a detour to Panarea, the smallest island of the Eolie, beautiful and very expensive, because Italian millionaires like to stay here – we go further north to Stromboli. Stromboli: Volcano pure, from a depth of 2000 meters below sea level to 924 meters above sea level and continuously active since 2000 years. Stromboli village in the northeast – actually several small settlements – is the starting point for the rewarding ascent to the volcano summit. It starts from the settlement Piscita. A few kilometers, but a must! –. The 2 ½-3 hour ascent – only with guide – is a unique opportunity to admire the breathtaking night fireworks of nature. The crater spitting several times an hour is fascinating and a unique experience in Europe. The guides know the mountain and the weather, that’s good. Alternatively, the old path up to 400 meters is also possible without a guide, from there you have a good view to the fire slide on the crater, a grandiose panorama. Alternatively, the old path up to 400 meters is also possible without a guide, from there you have a good view to the fire slide on the crater, a grandiose panorama. It’s a beautiful nocturnal spectacle. For the hikers, the reward is the terrace with Strombolicchio view and a cool drink. Maybe we’ll stay or maybe we’ll sail south to Lipari. Isola Lipari, with the 602 meters high mountain Chirica, is very impressive and with 38 square meters the largest island. 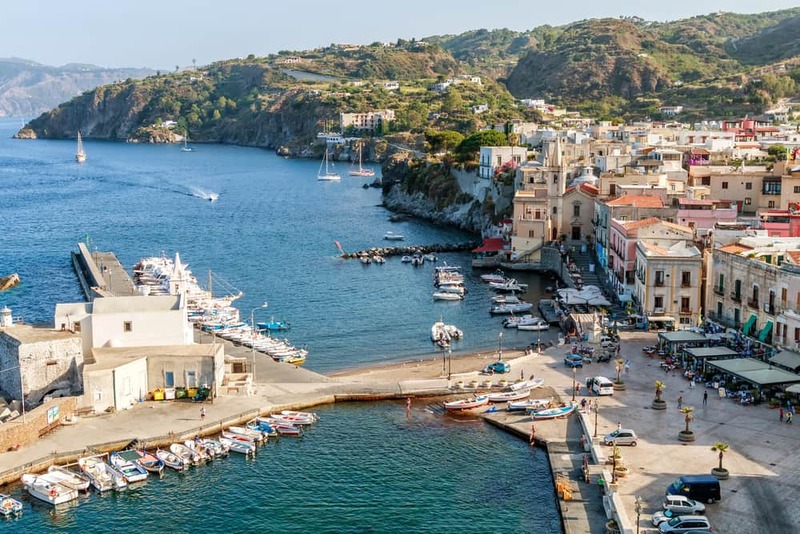 Here is the `capital city’ of the archipelago: Lipari City. The pretty, lively city is idyllically situated on a rock of lava and the castle with massive walls from Spanish times gives an idea of the impressive history. Here a tour of the island and a visit to the old observatory are worthwhile. That’s where we go by foot. The island offers many beautiful beaches and bays. In the north lies `Aquacalda`, the `warm water`, with a beautiful view of the islands Panarea and Salina. Isola Vulcano -Sicily’s nearest island welcomes us with its typical sulphur smell, there are signs of volcanic activity everywhere. The 21 sq m large island is a health resort and therefore it is called `mud battle`. The Geoterme Vulcano with healing mud helps against rheumatism and skin diseases. The visit is worthwhile and afterwards it goes to the thermal springs in the sea to get a massage. Today, Capo di Milazzo is on the program in northeastern Sicily. The 78 m high lighthouse offers a wonderful panoramic view of the Lipari Islands. The upper town and the Castello of Milazzo are worth a visit. A beautiful sailing trip leads us to the Strait of Messina, Stretto di Messina, only 3 km wide at the narrowest point to Calabria, where the Tyrrhenian Sea meets the Ionian Sea. With its plankton-rich waters, the Strait of Messina is an El Dorado for many fish species. The east coast of Sicily is the richest and most visited region. A stop for a swim a little further south on the coast with a view of the mountain ranges in the hinterland is a must. We stay overnight in Ali Terme and enjoy the view of the mountain ranges in the hinterland. In the last morning we have to enjoy the wonderful water again before we lift our anchor and arrive near Taormina at noon. Taormina is a holiday resort, but with a lot of charm. The location, 200 meters high above the coast, is fantastic and the view of the gigantic Etna is fantastic. Small squares, angular alleys, great facades tempt to a visit. Easy checkout at 4 p.m. Departure from Catania, we arrange the transfer on site. This route is a non-binding proposal, what we head for, we decide locally depending on wind & weather. The Caribbean, Cape Verde, Canary Islands, Senegal and Gibraltar – we also experienced this, enjoyed a cognac with Cesaria Evora in a water glass in Mindelo and admired the bizarre dragon trees on Gomera, visited Dakar and climbed the monkey rock in Gibraltar – with homemade cherry cake… We will remain faithful to our Mediterranean and drive now also in Italy to Sardinien completely as well as to Sicily, to the liparischen islands. For the future we imagine one or two – extended Cape Verde – and Caribbean rounds over the winter months – it simply must happen again!